I remember Gotcha. I briefly flirted with the idea of being a skater in the 80's. But soon realized my sports skill set was better suited for team sports where my ineptitude could be hidden behind others. I was never so cool as to get Gotcha, though I love that loud green color. I may have tried boogie boarding once or twice, but that was the extent of my CA beach adventures. Guess my mind is overwhelmed with the verdict, I'm not remembering Gotcha. 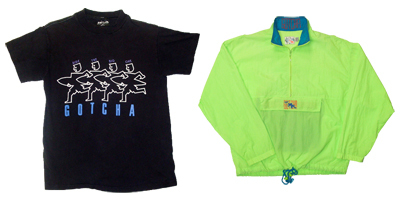 Never wore this stuff, but I did wear the Rude Dog brand from the 90s...loved it. To me, Gotcha was my favorite all time movie of the 80s starring Mr. Anthony Edwards. BTW...I made you blog of the day. I skate and i also love gotcha!